After several years of warnings, deadline extensions, and urgent pleas for users to upgrade already, Microsoft has finally washed its hands of Windows XP. Today marks the long-anticipated end of the company’s support for 13-year-old XP, meaning that there will be no further security patches for what is still the world’s second most popular desktop operating system. Not coincidentally, it is also the unofficial Let’s Hack The Bejesus Out Of Windows XP day, as cyberspace miscreants prey on a ready-made population of uninformed, unprotected users. 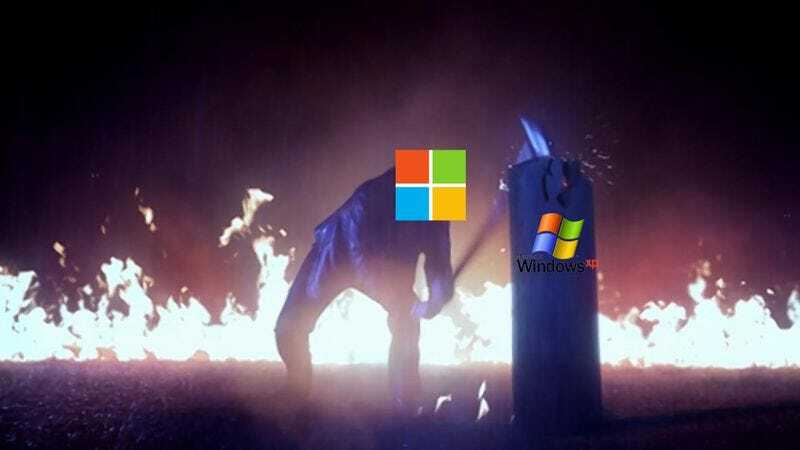 For a while now, Microsoft flacks and outside security experts have warned that continuing to use XP is the computerized equivalent of licking an expired Stouffer’s lasagna off the floor of a Bangkok whorehouse. You’re going to get a disease, and probably a disease that nobody has ever seen before. Yet huge portions of the user base have refused to listen. Perhaps they resist because the newest version of Windows is terrible, or because they have specialized applications that don’t work with newer versions, or because upgrading would force them to close their Minesweeper window, and they’ve got a really good game going. “I wouldn’t be surprised if the hacking community has been reserving exploits until after support ends,” [computer-security type David] Johnson said. Microsoft itself has predicted that crafty hackers will try to parse out future Windows patches and updates, attempting to identify equivalent vulnerabilities in XP. According to our own traffic data, about 7 percent of A.V. Club visitors view the site on a Windows XP computer. For those readers, we’re happy to provide a link to important resources you may need.